As soon as Zachary Blumenfeld was born, he needed treatment for several serious heart conditions including pulmonary atresia, which meant that his pulmonary valve was sealed shut. A successful procedure during Zach’s first few weeks of life was followed by two others before his 10th birthday. Today, looking at Zachary with that infectious smile, athleticism, and smarts – the kid who his mom says is "fiercely determined" – you could never imagine him in a hospital room. Happily, that determination is now aimed at helping other kids with similar medical challenges. Zach has been like a little ambassador for our Africa work. Inspired by the positive outcomes of his own heart treatment, the enthusiastic 11-year-old Washington, DC, native would like to spread miracles around the world, and help other kids fighting heart issues. He is particularly committed to supporting his physician, Craig Sable, MD, meet the needs of other children with heart problems--particularly those in Africa, where Dr. Sable is developing a surgery center.Zachary is helping to make strides in cardiac care through the Zachary Asher Blumenfeld Fund, a fund his family created in 2003 through the Children’s Hospital Foundation. However, the fund is not the only way in which Zachary is helping kids just like him. He has already spent time with Dr. Sable’s patients from African and even attended functions to raise awareness of heart disease. And now he is now developing a business plan to place slushy stands at local baseball camps and Little League games to raise money for these kids he so identifies with, says his mother, Liz Blumenfeld. Zach’s pulmonary atresia resulted in his first procedure at Children’s National. Cardiologists Gerard Martin, MD, Senior-Vice President of Children’s Center for Heart, Lung and Kidney Disease and Dr. Sable, Director of Echocardiography and Medical Director of Telemedicine, successfully opened the sealed valve so that the newborn could get oxygen in his blood without having to undergo open heart surgery. After the successful surgery, doctors dubbed Zachary the “miracle baby” and he was discharged at 6 weeks old.He wasn’t out of the clear yet. Before Zachary started kindergarten, he had a catheterization to close two holes in his heart. Then, at age 9 he underwent heart surgery to replace his pulmonary valve which no longer worked. Zachary had the opportunity two years ago to meet some of the patients he has helped support from afar. Dr. Sable had brought two of the Ugandan patients back with him to Children’s National to have heart procedures, and Zachary took this opportunity to ask Dr. Sable if the boys could come to his game, not only to present them with baseball gloves and his team’s caps and jerseys, but also to inspire them as to what is possible after having heart surgery. “We’ve been supporting Dr. Sable’s effort since the Children’s National cardiac team saved Zachary’s life,” says Liz.While Zachary has been doing his part in the District, Dr. Sable’s team has provided over 350 life-saving cardiac procedures for African children, while helping to create a surgery center so cardiologists there can continue to help themselves. Dr. Sable’s work through the Global Heart Program, and Zachary’s desire to help other children in need of care, were a natural fit for partnership. Zachary is proud of the work he has accomplished at such a young age and is dedicated to continue expanding his role. For his Bar Mitzvah project at 13, Zach plans to raise funds to continue to save the lives of children with heart procedures just like his. 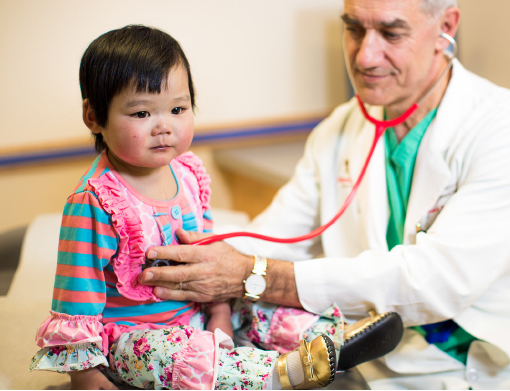 Learn more about pediatric Cardiology at Children’s National.